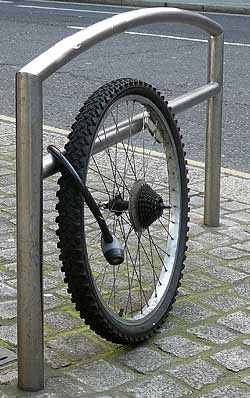 A couple of weeks ago, London's bike racks seemed festooned with wheelless frames. Yesterday it was the other way round, with cycle parking apparently a nesting-ground for frameless wheels (top, Barbican; middle, Southwark Bridge Road), the remainder of the bike having easily been liberated without the need for bolt-cutters. Are the two types connected? Are theft patterns changing to reflect different types of carelessness among those locking up their machines? 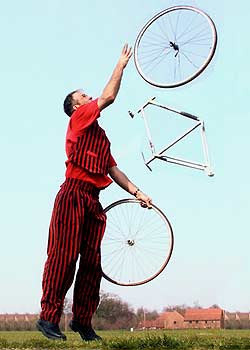 Is this juggler anything to do with it, perhaps using the bike racks to store his equipment between street-entertainment gigs? 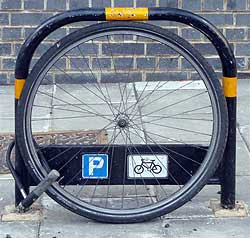 We have a few of the same examples here in Dublin .But there is an added twist also of coming across Bent Wheels on Bicycles Parked on Racks. Some People get a Kick out of Bending your Wheels for some reason.